Clark Stationery - Embossed Graphics - For more stationery choices click Embossed Graphics to go to our sister site to order. 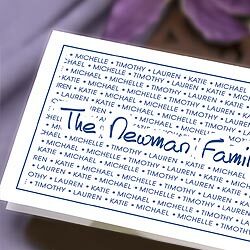 Item Name: For more stationery choices click Embossed Graphics to go to our sister site to order. Description: For more stationery choices and pricing click Embossed Graphics to go to our sister site to order. 6.2" X 4.5" folded Notes with a last name and family names. Available in white or ivory paper with ink color choices Navy, Black, Red, Emerald, Slate, Fuchsia, Purple, Mocha, Ocean and Sage. Return address also available in matching ink color. Pricing: For more stationery choices and pricing click Embossed Graphics to go to our sister site to order.